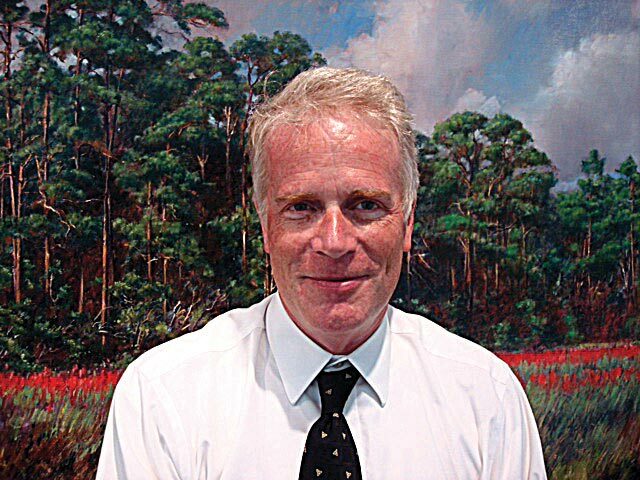 Kevin O’Brien has brought a wealth of experience and expertise in the Art world to the Gulf Coast. He holds a Bachelor of Fine Arts degree in Painting and Art History from the University of Notre Dame, as well as a Masters in Fine Arts and Painting from Tulane University. For thirty years he has served as Executive Director of Art and History museums throughout America. “I have always made it a point to seek out unusual and different museum projects to be involved in. The artwork itself is very, very important but I am also extremely interested in who created the artwork. George Ohr was truly one of the greatest artists who ever lived, he was a true American Master, a genius, and way ahead of his time,” O’Brien said. There were a number of things that sparked his interest in coming to Biloxi. The incredible, one-of-a-kind architectural design of the museum by international architect, Frank Gehry, was a very exciting aspect to the project. Gehry also built the massive, titanium-clad Guggenheim Museum in Spain and in doing so, revived the tourism industry in the city of Bilbao in the late 90’s. But most importantly, to have the opportunity to represent the work of George Ohr, in the actual origin of of it’s birth and development, was the icing on the cake for Kevin O’Brien. “The work of George Ohr is so important. Biloxi will have a wonderful museum and it will eventually have an international reputation,” he said. O’Brien wanted to make a difference and shake things up with a museum that was a little bit different than a traditional museum, and he wanted to see it grow and develop into a nationally recognized treasure. The Ohr-O’Keefe Museum was exactly what he was looking for, it was the perfect fit. George Ohr referred to himself as the mad potter of Biloxi, but the man was nothing short of brilliant and is considered to be a forerunner of the American modern art movement. The museum will be a really unique showplace upon completion. At this time, it is still a work in progress. Battered and bruised over the years by hurricanes and many financial ups and downs, it has been a slow process to finish the project. There is a beautiful winding red brick walkway that curves gracefully around the property. It leads guests to each individual gallery and by the pods. The pods are the odd shaped, gleaming stainless steel structures that will eventually be finished with a “second skin” that will catch all the natural light from the sun. The extensive collection of George Ohr pottery will be housed in the pods and provide an outstanding environment for viewing all the priceless pieces of art. “We need to finish this project. It still looks like a construction site and it confuses the public because there is still so much work left to be done, but we are slated for March, 2014, to have the outer skins finished on the pods. We will then open up the grounds and be ready to receive visitors and have most features up and running,” O’Brien said. The pods are a mystery to most people. They are strange shapes, odd sizes, and look like something from a Science fiction movie. These bizarre structures keep people guessing but the truth is, they were designed to compliment and the very avant guard, imaginative, and unusual style of pottery and ceramics that George Ohr introduced to the world so long ago. The pods are there to mimic his unique style. They are each amplifications of George Ohr pottery! When the pods are finished, they will be extraordinary reminders of his work, and are destined to become an endearing Coast landmark that will be the talk of the town, and perhaps one day, the world. Kevin O’Brien is going to broaden the exhibition programs offered at the museum. Exhibitions will change every four months rather than be on display for six months at a time. He is planning to integrate a series of popular culture exhibits along with the fine art exhibitions. Guests of the museum will enjoy all kinds of fascinating exhibits including tapestries, silverworks, vintage motorcycles, guitars, and art glass, as well as hi tech interactive exhibits, car art, and even quilts, and fishing lures! Fine art exhibits will feature local, regional, and national artists. “I also plan to set aside a time to feature young, budding artists in our high schools to give them some exposure and a real gallery experience,” he said. The most important point will always be to celebrate the national significance of George Ohr and his remarkable ceramics and pottery. In addition to the varied exhibits, the director is going to offer all kinds of family fun events throughout the year. “I am very interested in having this place be a family destination for special and unusual outdoor activities. We would like to host a pig roast and perhaps have cook off competitions involving local chefs. There are so many things I am going to do, including a resumption of the Ohr Fall Festival. I welcome ideas and suggestions from all coastal communities. I want this place to be a center for community activity, with a major focus on the development of education and programming,” he said. O’Brien is also looking forward to hosting events on the grounds of the museum that will cater to specific cultural groups. The museum is generously supported by private organizations, Coast citizens, corporations, Coast casinos, and local, state, and federal programs. Frank Gehry oversees every aspect of the continued development of the property, and everything must be approved by Gehry & Associates. “This museum will be one of national importance and it is imperative that everything, down to the signage, be designed accordingly,” O’Brien said. A beautifully landscaped route to the museum from Hwy 90 will be featured as well upon completion. There are also plans to replenish the oak trees that were lost in hurricane Katrina. A major advertising campaign will go into affect in mid March, 2014. OOMA (Ohr-O’Keefe Museum of Art) will use a combination of print and electronic media as well as celebratory banners on Hwy 90. An economic tourism grant will assist in paying for the PR expenses. All public relations affairs will be handled by the GodwinGroup. When the time comes, the announcement of the grand opening is also expected to be a huge national media event with coverage on major network morning news shows. “We want to introduce Ohr to a broader audience so they will know of his importance in the art world,” O’Brien said. Kevin O’Brien is so excited to be at the helm of the Ohr-O’Keefe Museum of Art. “People who are into ceramics and pottery throughout the museum community are completely in awe of what George Ohr has done. He is a big, big deal! The Metropolitan Museum of Art is purchasing pieces and the Smithsonian owns some as well. All major museum’s proudly display the work of George Ohr,” he said. Although nobody wants to think about it, the time may come again when the Coast is faced with another catastrophic hurricane. In the event that a named storm moves into the Gulf and threatens South Mississippi, the entire permanent collection in the museum will be moved to a safe location in Atlanta, Georgia. Presenters of temporary exhibits that contain materials that are not part of the OOMA collection are responsible for picking up their exhibits and moving them to a safe location of their choosing. “We have a very specific hurricane plan that will be put into action if the need ever arises. The plan will be utilized under the direction of myself and the Board,” O’Brien said. The director is particularly appreciative to the O’Keefe family for their support and involvement in the museum development. The Beau Rivage Casino Resort and the IP have also been staunch supporters of the project, and the city of Biloxi has been behind the construction of the Ohr-O’Keefe Museum of Art since day one.”It’s very exciting as we have had a lot of national support as well” O’Brien said. There are a lot of building materials being stored in a warehouse in Kansas City, just waiting to be shipped down. “We are on target for our soft opening next Spring but there is still a great deal of work to be done,” O’Brien said. Kevin believes that they will achieve a full transition from a construction project to a fully functioning museum entity within one to two years. “Once we have a full roster of exhibitions, education and community programs, the immense value offered to the Gulf Coast community can be fully realized, appreciated, and supported. I want people to feel very welcome at the OOMA and to know that they can come and enjoy it whenever they like,” he said. It has only been a few short weeks since Kevin O’Brien moved to the Gulf Coast but he loves the area and feels right at home. He will be joined by his wife in November. They are anxiously awaiting the birth of their fourth grandchild! Go To Places Monthly is very pleased to name Kevin O’Brien as our October Mover & Shaker and we welcome him to the Coast. Congratulations!